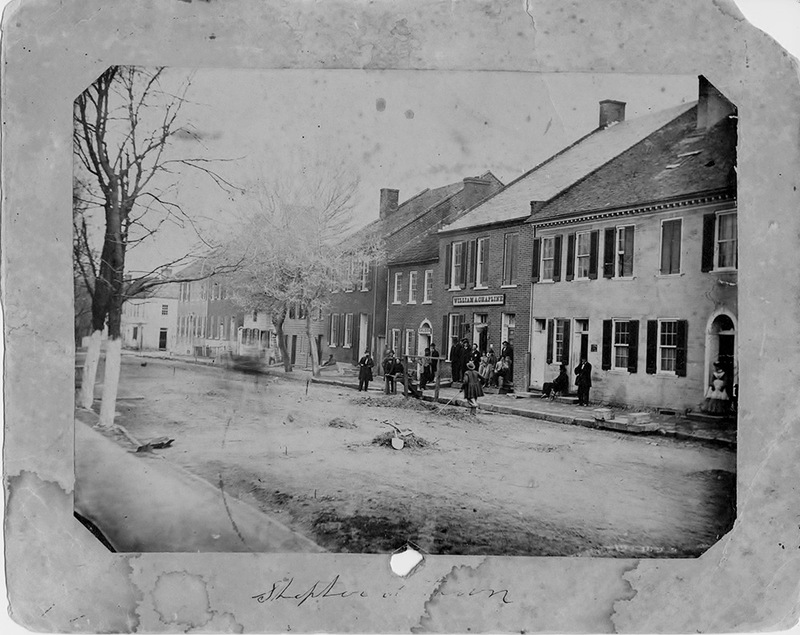 Shepherdstown during the Civil War, from the Historic Shepherdstown archives. Located on the boarder of the Virginia Maryland border, Shepherdstown was split on the line between the federal government and the rebellious states in early 1861. The town was still a part of the union until the state of Virginia decided to break away from the union to protect its self from outside forces or “invaders” to suppress a rebellion in the Deep South. When this break happened, Shepherdstown was along for the ride with the rest of the state, which stretched up as far north as the Pennsylvania and Ohio territory and as far south as North Carolina. When a bill of secession was passed by the state of Virginia, men from Shepherdstown went to both sides of the fight. One company of men (soon to become company B) joined the ranks of the 2nd Virginia volunteer regiment. This regiment was paired with four other Virginia regiments to create the first brigade of General Joe Johnston’s force stationed in Harpers Ferry. Col. Thomas “Stonewall” Jackson was in command of the first brigade. During this first year of war, Shepherdstown was still a calm town. The war was right next door to the town but it had not affected the town directly. The town would not be so lucky the second year of war. By the end of 1862, the major fighting had moved down to the vicinity of Fredericksburg Virginia. This rolled over into the beginning of 1863 and into what turned into the battle of Chancellorsville. Shepherdstown was still recuperating from its role earlier in 1862 but was on the mend from that ghastly event. Its time seeing masses of men march had not yet come to an end. In the summer of 1863, Lee and his army went up to the union territory one last time, headed for Harrisburg Pennsylvania. On their march they came right through this section of what had now become the union state of West Virginia. Lee march his army through Winchester Virginia and into the eastern panhandle of the newly formed state, through Martinsburg and Shepherdstown. The union army trailed behind through Maryland and hit Frederick and Westminster. This march and trail lead to what would become the high tide of the confederacy, Gettysburg. Shepherdstown was not safe from this battle and its aftermath. During the confederate retreat from Gettysburg, a small skirmish broke out in the small village of Williamsport Maryland, only 15 miles away from Shepherdstown. After this small fight, the confederates crossed back the way they came earlier in the month through Shepherdstown Martinsburg area to the Winchester area back in Virginia and continue to move down to the Culpeper court house area until 1864. Shepherdstown lay away from the violence and bloodshed of the physical war, but the reminder that war was upon them still lingered. The eastern panhandle was garrisoned by federal troops in Martinsburg and Harpers Ferry. Shepherdstown is conveniently located directly between these two locations and holds one of the few fords for crossing the Potomac, one at Williamsport (Whites Ford), one at Shepherdstown, and one around Harpers Ferry. Because of this, union troops were traversing through the area of Shepherdstown to move between these two garrisons. Another reminder of war was listings of men who went to fight that would not come back home. By this time in the war, the famed Stonewall brigade (holding company B, 2nd Virginia, from Shepherdstown) had all but dissolved to a small regiment filtered into another brigade. For the residents of Shepherdstown, this meant more death and destruction was to be dealt to their boys on the front. To add to their stress, one of Lee’s last bold moves made was dispatching an entire Corps of his army, under the command of General Jubal Early, was sent up to the Shenandoah Valley to cause mayhem. This brought the physical war back to the area of Shepherdstown when Early took Harpers Ferry and destroyed the federal garrison there. Parts of the old Stonewall division[ii] marched across Boteler’s ford and through the battle grounds of Sharpsburg Maryland while marching toward Washington D.C. Shepherdstown was yet again a passing point to these large armies of the Civil War. Throughout the Civil War, Shepherdstown was a center point of the Civil War in the eastern theater because of its proximity to a crossing of the Potomac. Only one real fight happened in Shepherdstown, but the war was very apparent and real to the town throughout the entire war, from the beginning in 1860 to the end in 1865. The only fight in Shepherdstown happened in 1862, but battles happened all around Shepherdstown throughout the entire war. Some of those locations happened in Harpers Ferry, Martinsburg, Shepherdstown, Kerneysville, and Charles Town WV; Sharpsburg, Williamsport, Hagerstown, and Frederick MD; Winchester and Leesburg VA. All of these places were battles or fights that involved cross the Potomac River, and Shepherdstown was a major crossing point for both armies. This left the town in a crippled condition and the town had to recuperate from the war with the rest of the country. [i] To learn more about the hospital of Shepherdstown in 1862, read Kevin Pawlak’s Shepherdstown in the Civil War. [ii] The Stonewall division was created in 1861 and was headed by Stonewall Jackson. This command consisted of his old stonewall brigade and other brigades and would earn the nickname of Stonewalls “foot cavalry” during his Valley Campaign of ‘61 and ’62.